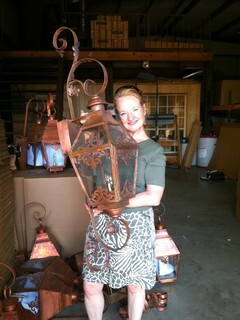 Sheryl has been designing gas and electric lanterns since 2003. Her lanterns can be seen on resorts in Mexico, Hotels in California, Historic Homes in Washington D.C., Restaurants in Chicago and New York and homes all over the USA, Canada and Mexico. She has even designed lanterns over six feet in height for a high rise condominium in Rhode Island.